The best exercise ever: jumping rope. Jumping rope prepares the body to interact with gravity and stress—making it the perfect precursor to running. It strengthens the connective tissue, solidifies the bones, develops the tendons, and teaches the muscles how to “talk” to each other through the stretch reflex. Most people jump rope incorrectly: they use their calfs as the major pushoff muscles. But then, why is it so ubiquitous? Because it is neurologically a lot simpler to use two muscles than to use a lot of them. Most people’s bodies never learned to use all their muscles in dynamic activities: parents prefer to keep their kids inside throughout their critical periods (1-6 years of age). The parental risk aversion that translates to a reduction in dynamic play impoverishes the brain’s sensorimotor opportunities. Simply stated, the brain never learned how to use all of the muscles together—it didn’t have to. So the brain chooses the quick way out: it only uses the calfs. But the calf muscles were never “designed” to push off (in the sense that the arm muscles were never “designed” to support the body while running). Their function is to make sure that the foot remains at the correct angle in relation to the ground throughout the landing and propulsion of all leg-based activities. 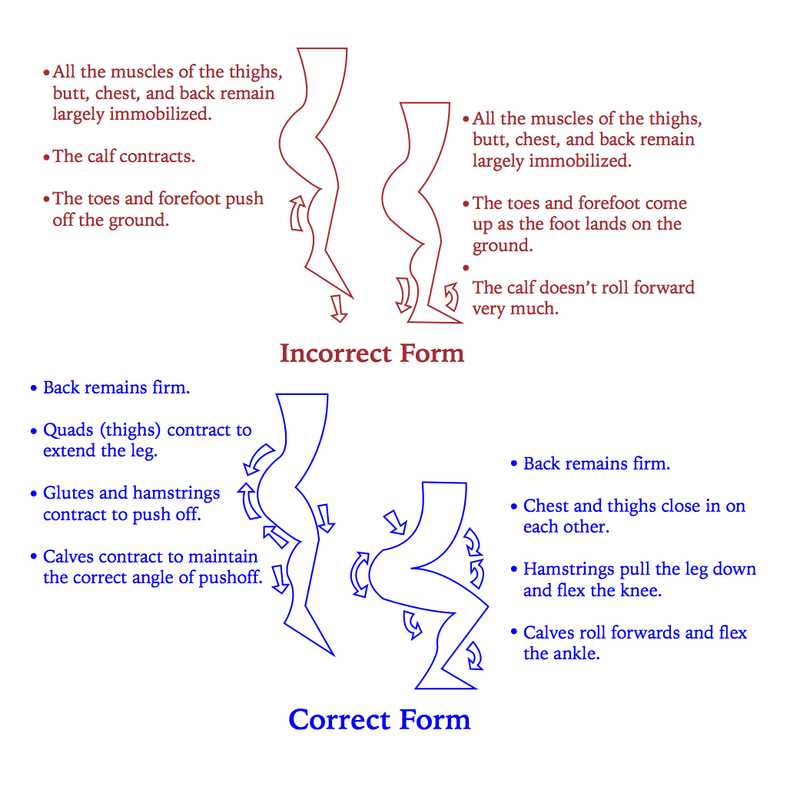 In other words, the calf muscles are designed to effectively transfer the force from the quads and the glutes into the ground, not as pushing muscles. If we use them to push off, we overload them—but more importantly we use the entire leg and hip system in a way that it was never meant to be used. And what does this translate to? To correct this, we need to train our muscles to interact correctly, and we need to make the brain realize that there is a way to use the most powerful muscles in the body, the quads and the glutes, as the main motors of propulsion. If we use the tiny calf muscles as our main pushing muscles, we will never become the fastest, most athletic version of ourselves.